North East holistic shop for dogs stocking a range of raw food from Manifold Valley Meats, The Dogs Butcher and Nutriment alongside herbal supplements and natural treats. This shop is a little gem and a must for all owners who want the best for their dogs. The owner Joanne is very knowledgeable, friendly and helpful – nothing is too much trouble for her. The delivery service in particular has made raw feeding even easier and the food is of very high quality. Both my dogs love it (one is a very picky eater). I would not hesitate to recommend anyone who cares about their dog to pay Joanne a visit. I’m so pleased that The Wandering Dog opened, I was even more pleased with the friendly and helpful service they provide. My raw fed pugs are even more pleased as their full stomach will attest to, the variety they sell is fabulous. Will definitely be my first port of call for their food (and a friendly chat too)!! Fantastic shop, very friendly and always happy to help! Just recently started my 2 miniature schnauzers on raw after discovering this gem of a shop! And I’ve had the best of help and advice from Joanne, she has a great variety of raw foods and natural treats! I highly recommend! when I found out the wandering dog was opening I was over the moon, my raw fed Dobermann is my baby and I only want the best for him. I had been let down far too many times by other supplies and when I met Joanne I instantly warmed to her and have never looked back. The food is always of a high quality and I have never had an issue with any of my orders. Joanne is friendly and full of knowledge and her love for animals shows in everything she does. We will not go anywhere else now and I look forward to collection days as it gives me a chance to visit the shop and have a chat with Joanne. Amazing service, such a lovely lady happy to go the extra mile for you. Plenty of stock. Happy to get stock in from nominated suppliers, which are not carried in the store. Excellent service all round 🙂 I would be lost without Joanne! Great little shop! Fab owners who go out their way to help customers! Never have I met such a friendly and helpful shop owner, nothing is too much trouble for Joanne. The food she stocks is great with a wide selection and what she doesn’t have in she will do her very best to source it for you. I’m yet to try the herbal remedies but I’m sure that time will come. 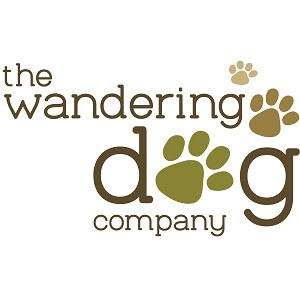 I can’t praise the Wandering Dog Company enough, the help and service has been and is second to non. My beagle Wor Gus has been getting his food from here since we started on the raw journey. With help and advise from Joanne he has turned into a healthy well adjusted dog with a broad appetite. My brother in law in now a firm customer and I’m forever getting on people’s nerves advising them on how much healthier their dogs would be on a raw diet.